The Wild Inside is an excellent debut novel with a unique and very sympathetic protagonist. As a fourteen-year-old boy in the Fall of 1987, Ted Systead went camping with his father in Glacier National Park in northwestern Montana. While the two of them slept that night, a large grizzly bear attacked their tent, dragged Systead’s father away and mauled him to death. Fortunately, the bear did not return to attack Ted, but the boy, though physically safe, was very badly traumatized by the episode. Twenty years later, Ted Systead is still haunted by the events of that night. He now lives in Denver and works as a Special Agent for the Department of the Interior, investigating crimes that occur in the national park system. 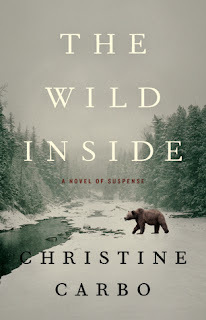 But when he’s assigned to lead a death investigation in Glacier National Park, he’s forced to confront not only a complex criminal case, but the personal demons he still harbors inside as well. The victim of the crime is a low-life meth addict named Victor Lance. Lance was found duct-taped to a tree in the park and shot. While he was still alive and unable to defend himself, a grizzly bear found him and finished off the job that the killer had left undone. The fact that the death was so horrific, that it occurred in Glacier, and that a grizzly was involved, all hit a bit too close to home for Systead, and at times seem to compromise his ability to function effectively. He’s also hampered by a lack of evidence, by uncooperative witnesses, and by a park supervisor who’s more concerned about avoiding bad publicity than he is in assisting the investigation. But Systead forges ahead, determined to see justice done, no matter the personal and other obstacles that confront him. Carbo, who lives in Whitefish, Montana, obviously knows the park, the surrounding area and the people of the region very well. She’s at her best in describing the great scenic beauty of the park as well as the small and sometimes not-so-scenic communities that surround it. Many of the people of the area are loners, suspicious of outsiders, and are especially wary of federal authorities. Sad to say, there is an ongoing problem with meth and other drugs in northwestern Montana, and Carbo doesn’t shy away from showing us the toll that drug abuse is taking on these people and their communities. The end result is a gripping story that explores both the wilderness of the natural world and that of the human psyche. Readers will finish the book looking forward eagerly to Carbo’s next effort.